I have been waiting to blog on Ah Seng Durians since last year but by the time i was done with my backlog, the durian season was already over. Whatever the case, it is the season again and i now bring to you arguably the most famous durian stall in Western Singapore; Ah Seng! Not to be confused with the Sembawang Durian Seng (榴莲成), this Ah Seng Durian stall had a 'permanent' presence at Block 150A, Ghim Moh Road which was ironically a temporary market while the old premise was being renovated. A visit was scheduled two weeks ago at the start of the durian season when prices were generally still expensive. As all the species were sold out except for "gan hai", which wasn't spectacular, i decided to drop by another day with my mum. See how crazy Singaporeans are over the thorny fruits! I was back once again last Saturday and this time round, we got smart; we pre-ordered one phoenix and two cat mountain king durians! There's no way i am going to be disappointed again! Even though we arrived on time at 1.30 pm, the stocks had yet to arrive from Malaysia; said to be traffic jam on the causeway / second link. Nevertheless, we fixed our craving by ordering one gan hai and one D13. D13 was much better as expected and for the three of us who had gan hai two weeks ago, we came to the conclusion that gan hai was absolutely not our cup of tea! 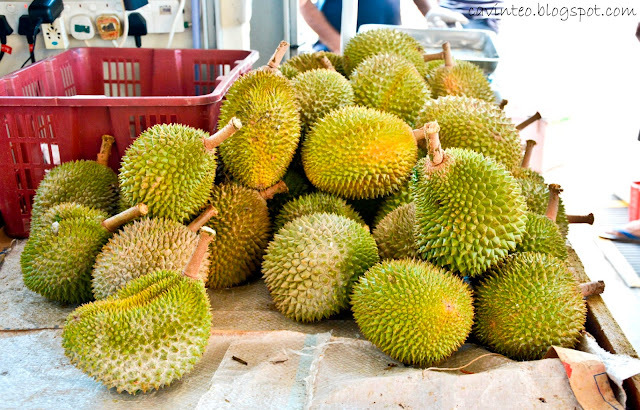 With the above in mind, we requested for another two D13 durians to supplement our intake. There were five of us and no way can two durians ease our insatiable craving! Having durians alfresco style in a suburban neighbour was so my kind of thing although I would suggest coming by at night when the temperature would be much lower. Arrival of the stocks! Or so i thought before it dawned on me that the baskets of durians were for the durian stall next to Ah Seng. Sigh, time at this moment was 2.15 pm. Less than ten minutes later, a truck and pickup lorry were sighted delivering the king of fruits to Ah Seng! By then, the whole place was filled with people and you can feel the excitement of those who have been waiting for ages; like us! Time for the staff to call up the number for you to pick up your pre-orders! By the way, the man in black polo tshirt is Ah Seng; i know him but he doesn't know me; to me, I am just a hungry customer, that's all. Two MaoShanWangs and one phoenix! As the saying goes, go for the cat mountain king first as its rich flavour would likely render the lower species less tasty. And so we did; i never knew the phoenix species was so tiny! 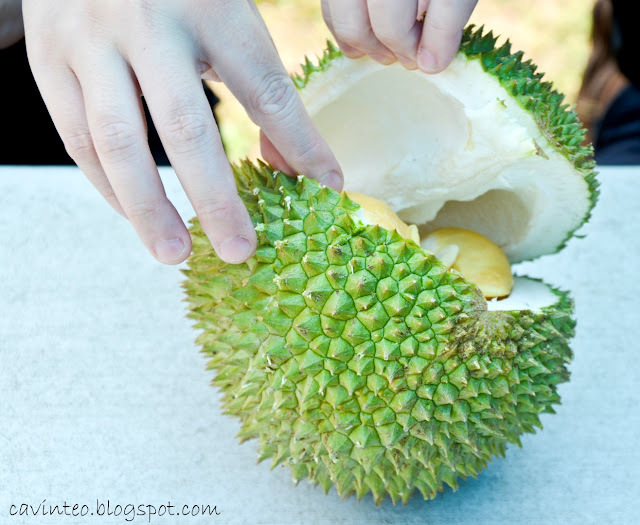 But we didn't regret the order; small it was yet it was compact with many seeds covered in delicious durian flesh! Every segment was just bursting with glorious durian meat that every one of us had to give it a thumbs up. In comparison to the puny phoenix, the maoshanwang was a giant! Blessed with generous yellowish flesh, it was my first cat mountain king this season and i could not wait to savour the fruit and let its texture, taste and aroma explode in my mouth! Strangely, it wasn't as good as i remember. The taste didn't overwhelm me as it did the first time i had the species at Sindy Durians @ Balestier. It also didn't help that the meat was also rather hard. Why the seed looked so weird!?!? Anyway, our durian experience ended on quite an anti-climax note and that was kind of surprising! Hopefully the rest of the customers, who were still eagerly waiting for their orders when we left, had better chances with their cat mountain kings! Complimentary water was kindly given! The baskets of durians were for those who had pre-ordered. Still pretty tidy then as the durian season had yet to hit its full swing and prices were not as cheap as now! Eating durians is a messy business and if you prefer not to show your ugly side in public (especially with the burping afterwards), it might be recommended to take away your durians! That's when you would love the two machines in the picture. 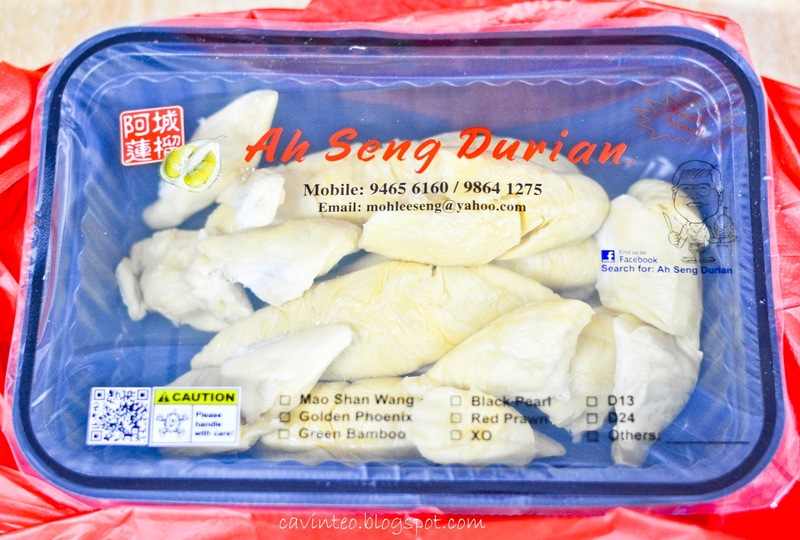 Durians in tightly sealed boxes! No more injuring those passengers together with you in the trains and buses and most importantly, no pungent durian smell while you bring them home! Go for the vacuum pack if you need to bring them overseas to fellow Singaporeans who are residing elsewhere yet miss the delicious fruit! Said to be 100% smell free! Last Day of My Kota Kinabalu (KK) Trip!